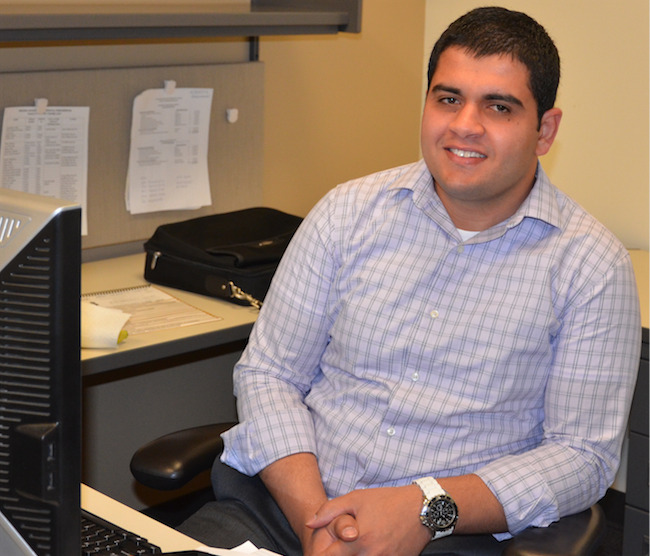 Asem Aboelzahab has joined the Weldon School as instructional laboratory coordinator. Aboelzahab will oversee the daily instructional laboratory operations, including preparing and maintaining lab experiments, assisting faculty in curriculum development, laboratory protocol testing, maintaining laboratory spaces and equipment in a clean and safe condition, and more. Aboelzahab earned a BS and MS in bioengineering from the University of Toledo in 2010 and 2012, respectively. While at University of Toledo, Aboelzahab collaborated with multiple research groups and physicians on orthopedic projects and taught college-level courses in tissue engineering, biomedical electronics, solid works, and Matlab. He notes that the Weldon School is in a prime location to inspire students. “I’ve known Indiana to be a concentrated hub for the biomedical industry, and the Research Park at Purdue is the source of several successful companies,” he said. “Biomedical engineering as a state-of-the-art field with a high level of technology being implemented regularly.” He hopes to foster excitement for these ever-evolving technological advancements in all aspects of his teaching. Corey Linkel replaces Jeremy Hale as the Associate Director of Undergraduate Programs, where he looks to maintain the excellence in experiential learning programming for Weldon undergraduates that has been provided in the past while developing new opportunities for students and streamlining processes within undergraduate programs. Corey has a long history with Purdue University, as a proud two-time alumnus and employee since 2007. Corey’s passion for college student development was shaped by his previous positions as academic advisor and assistant director of the Honors program in the College of Liberal Arts and as student affairs specialist in the Office of the Dean of Students. Corey is delighted to be working in the Weldon School, and looks forward to forging new bonds with industry partners and study abroad opportunities. Corey said that he is most excited to work directly with the undergraduate students, faculty, and staff that comprise the “Weldon family”. He is grateful for the warm welcome that he has already received from everyone. Kate Marrero joins us as our new undergraduate program academic adviser and brings a strong foundation of both theory and practice to her position at the Weldon School. Marrero graduated with a BS in psychology from Purdue University and MSE in college student personnel from the University of Dayton. She was a graduate assistant for the UD’s Women’s Center, interned in the career services office, and worked with international students in UD’s Center for International Programs. In these positions she gained experience incorporating diversity initiatives into the advising practice. Marrero chose to work at the Weldon School because of the passion exuded by the Weldon family. She cites the passion students have for the field, as well as the passion faculty and staff have for the success of students in the program as motivating factors behind the decision to choose Purdue. Vickie Maris is our new Director of Graduate Programs. In this role she oversees graduate student recruitment, admissions, professional development, retention, and placement. Her team members, Tammy Siemers, professional development and external relations specialist, and Sandy May, graduate programs assistant, serve key roles in these areas and are critical to the students’ experience. Maris is also a resource to faculty and staff in the strategic design of curriculum, particularly for courses being taught in the online environment. Many of the online students are early- to mid-career engineers connecting with their instructors and the school from locations throughout the globe. Her short term goals for the position include: a successful launch of the professional master’s degree, Biomedical Device Development; communications efforts with current graduate students and faculty leading to student success in awards, leadership opportunities and satisfying employment upon graduation; further development of graduate course online learning environments that better connect our distance learners to fellow students, instructors and campus resources; continued documentation and quality improvement of processes and transactions in the Academic Programs area; and the identification or development of opportunities for her staff and fellow team members to grow professionally as they serve the faculty and students. Maris teaches in the topics of business communications, online course design and use of social media for business connections, for marketing and for learning. She has also developed the course, Leadership Lessons Learned from Livestock, which she teaches in the Technical Management Institute at Purdue on an annual basis, and has keynoted the session at the statewide training conference held at the Governor’s Center for Management Development at the University of Texas – Austin. In a previous role, Maris was director of professional development programs with Purdue’s Division of Engineering Professional Education for nine years. While there, she led an award-winning team that developed, marketed, implemented and supported two online series of courses – Lean Six Sigma and Project Management – which collectively saw over 1400 enrollments in the most recent fiscal year. In addition, she and her staff were responsible for the other non-credit courses offered through EPE ranging from webinars and social media-based help sessions (Twitter chats) to onsite programs such as the Technical Management Institute offered in collaboration with the Krannert School of Management, and off-site short courses conducted at the Aero Institute in collaboration with NASA and corporate partners. Maris earned a BS in agricultural communications and a MS Ed in learning design and technology, both from Purdue. Her focus in her graduate program was in development of curriculum and instruction in online environments for adult learners. She recently earned her Lean Six Sigma Black Belt certification through Purdue University. Her first Black Belt project realized an annual cost savings of over $119,000. The project was in student retention. Prior to her time at the university, she worked in corporate America in marketing and communications roles for 13 years, serving the agricultural and software industries. Tammy Siemers joins us in the newly created position of professional development and external relations specialist. In this role Siemers will develop and expand the Weldon School’s industry partnerships and external relations. She will also work with graduate students to help build their professional skills and career development strategies, practice communication skills, and network with industry experts. Siemers has initiated a program of regular off-campus visits for graduate students to help foster a wider circle of contacts and expand knowledge of the broader biomedical engineering community. “Ideally I would love to schedule a one day trip and one longer trip each semester to allow our students to see the opportunities available to them in industry, government, and academia, as well as getting to know the city surroundings,” Siemers said. Previously, Siemers was coordinator for the Master’s in Engineering Management program in Purdue’s Division of Engineering Professional Education. She also was administrative assistant in the College of Science. She is a proud Purdue alumna, is thrilled to be working at the Weldon School, and looks forward to fostering partnerships with faculty, students, and industry partners. “I want to see what types of professional development opportunities will help students be the most successful for the next chapter of their lives,” Siemers said. Lester J. Smith, a Weldon School alumnus, has returned to the School to join the staff as laboratory and assessment coordinator, assisting faculty and staff in course development, laboratory protocol testing, written manual preparation for Senior Design, training undergraduates, and more. Smith earned a BS in mechanical engineering from Louisiana Tech University and a PhD in biomedical engineering from the Weldon School. 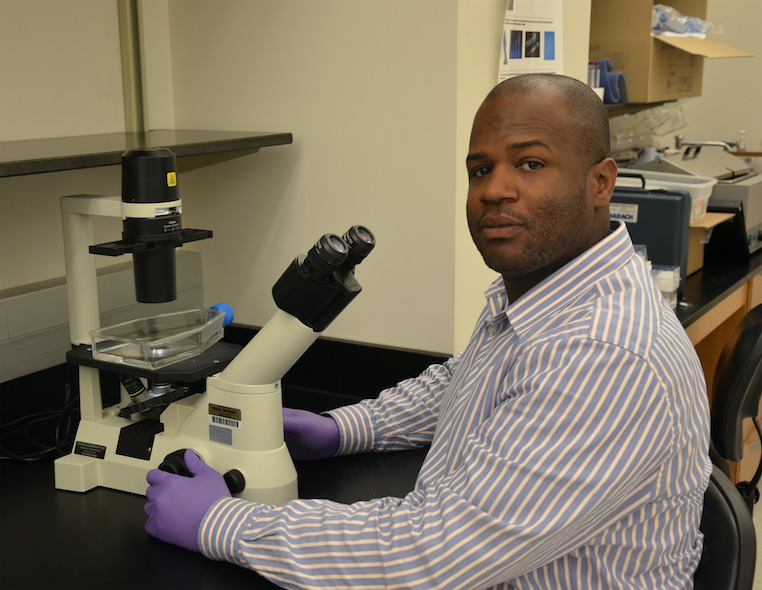 He completed his post-doctoral research at the Washington University School of Medicine in St. Louis where he researched orthopedic regenerative medicine. While in St. Louis, Smith developed expertise in biomedical education and training of undergraduate, graduate, and PhD students as well as in planning, developing, and executing business development processes and strategies for biomedical applications. Smith is proud to be back at the Weldon School because it is part of Purdue’s excellent engineering legacy, which is ever-improving, he said. He became interested in his current position due to the relationships and formative lessons he developed during his doctoral studies, which he said helped him develop personally and professionally. “The Weldon School wants you to succeed, but they will challenge you to do so, and I value this approach,” Smith said.